One noticeable change was that the 'paddock' had been mown in the last 10 days and, with continued un-seasonal rains, the grass had continued to grow up green rather than look like a hayfield. We stopped at the original swathe of cut grass where we'd photographed the Common sunray [Triptilodiscus pygmaeus] in December. There were very few of the tiny yellow daisies evident and these were surrounded by branches browning-off as their seeds set. I was delighted that Mervyn knew the name of a small-flowered pink weed. It colonises bare and degraded places and is now along the gravelly track-sides. It's Sand spurrey* [Spergularia rubra] and the photo of it in the Woods' book shows it as quite lush and greener than in reality. It is one of several species originally from North American and Europe. I first came across it near our Flynn bus stop, noticing that the flowers closed when the plant was pulled out for identification. Temptation saw gloved hands reaching for isolated specimens of St Johns Wort (SJW)* and Patersons Curse* as we strolled. An occasional Saffron Thistle* was uprooted also. It's easy to see how some of these species are constantly spreading in from the paddocks of the Kama property. As the locations of each of these invasive species are already mapped it's important to persist with the removal of these isolates to prevent escalation of new colonies. Fotpin members are spraying larger infestations. We could see that some of the SJW was beginning to show the delayed reaction to spraying with Starane. We discussed the merits of the treatments for such weeds noting that parts of the rhizomes remain in the soil even after careful pulling and that this particular season has seen mass germination of SJW in and around areas of mature plants. Skeleton weed* [Chondrilla juncea] and Hoary Mustard* [Hirschfeldia incana] were also common trackside. John and Mervyn each took specimens to see if their seeds would continue to ripen if the plants were pulled from the dampish soil and left to rot down. Another debate surrounded the Cranesbills and Stocksbills. Illustrations show that it's not easy to sort out the differences and we didn't even find a decent fruit amongst these young plants to show Maureen why they had bird-oriented names. There are several introduced Erodium species with Erodium meaning heron and bringing in yet another bird with a long probing beak. The small local Geranium species have pink flowers and Erodium crinitum has blue petals. Apparently the Aborigines used infusions of the Cranesbill for treating diahorrea as the plants contain tannin. Looking for and at plants rather set the scene for the walk but we paused to look at the photo of the Grey fantail’s nest in approximately the area where John pointed it out in a wattle tree in December. Calls showed we were clearly walking through the birds’ territory at several points. Do the birds really fan-out their tails in order to disturb insects? The part of the reserve near the southern, step-through gate (now locked open) is also Willie-wagtail territory. Their ‘rattly’ call can be evidence of their presence though other notes to their songs are much more musical. There was no activity near the burnt-out trunk that hosted the Dusky Woodswallows’ nest but several birds were perched on the skeletal remains of a Stringybark in the North Kama paddock. We were able to see the white tips to tail feathers and the brown-grey duskiness of the plumage. Seeing them set out to hawk insects during their wonderful flights was even better. A little east of the gate we looked at a hole in the bank that was the entrance to a Spotted Pardalote’s nest. It looks unused now but we’d seen a bird dart from it at the end of a weeding-session a few weeks before. Some areas of the bank were still damp enough to encourage fungi and we found several clusters of a tiny white toadstool I’d first noticed in paddocks to the east when surveying as part of the Native Grass Restoration Project. Further east there were ‘real’ mushrooms in the track’s soil but their white gills showed they weren’t safe at all. “This fungus [Leucoagaricus naucinus] resembles a field mushroom but the cap and gills are white.” Bruce Fuhrer writes on page 112. Leuco usually means white and I wonder if the naucinus shares origins with nausea? The ‘paper-daisies’ Xerochrysum viscosum were waiting for sun or greater warmth before opening yellow papery-bracts that look like petals. The rainy-spring has produced blooms and young plants almost in profusion in areas of the forest. Some of the leaves did feel slightly viscous or sticky. ‘Chrysum’ signifies yellow. There were two other yellow daisy species to admire. Clustered everlasting Chrysocephalum semipapposum and Common everlasting, C. apiculatum in the forest and on its grassland edges respectively. The dominant species in flower in the forest included other daisies in the form of Cassinia longifolia but these shrubs have cauliflower-shaped clusters of creamy-white flowers. Native blackthorn Bursaria Spinosa may look similar from a distance just now but there are small thorns amongst the foliage. Small birds can take advantage of this armour and it’s to be hoped we can eventually plant more Bursaria in place of the hundreds of Briar rose Rosa rubiginosa* removed in the last 18 months. Bursaria flowers were soaked to extract their nectar. One of the many time-consuming plant treatments that wouldn’t sit well with our sugar-addicted society! Lesley, Nola and Rita tested out the gaiters. They certainly reduced worry as we left the openness of the track. Once we’d moved up through grasses and rockiness to the knoll’s different vegetation patterns, another member of the daisy Asteraceae family became quite dominant. The several Vittadinia species are named after Carlo Vittadini (died 1865) who was a Milanese medical doctor and an author on fungi. Just as fungi are indispensable to plants and ecosystems so Vittadinia play vital roles in colonising bare ground. They have tiny pink-purple flowers and fuzzy seeds which blow away like dandelion seeds and give rise to the common name Fuzzweed for Vittadinia cuneata. Having seen a few clumps of Kangaroo grass, Themeda triandra, on the edge of the forest we came to the knoll to find Barbed wire grass, Cymbopogon refractus. Their spectacularly different flower-heads set them apart from other native and introduced grasses. Sometimes they occur together and sometimes Kangaroo grass can go through a phase of being over-dominant. There’s plenty of barbed wire on fences to see where the name came from. 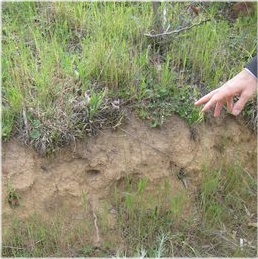 It’s a grass found in low-nutrient areas such as ridges. It has reasonable value as a fodder grass and can survive for long periods of drought if grazing pressure is not too high. I’ve heard that it germinates well in warmer conditions. Perhaps it’s one of the grasses we could use for restoring the Pinnacle’s biodiversity beyond the few places where it’s endured. Kangaroos may not regularly venture among the rocks to eat the young plants. Some Australian bindweed twined up the stems of taller plants. The name Convolvulus erubescens means little twiner and erubescens equates with blushing for the strong pink of the sun-loving flowers. The gaiters foiled the attempts of burrs from Sheep’s burr to reach our socks and laces. Acena ovina relates to the ‘thorns’ of the burrs and ovina for the way the wool of sheep attracts the annoying but successful fruits. Apparently this species is wind-pollinated whereas other members of the Roseaceae family, apples, roses, blackberry, cotoneaster, pyracantha are insect-pollinated. We briefly pondered the fact that the endangered Pink-tailed worm lizard has been found in The Pinnacle reserve and wondered if the lichen-covered rocks of the knoll harboured any of the legless reptiles. We moved north and then west towards the forest but could clearly see where Fotpin members, including John, have spent many hours brush-cutting amongst the thickets of Saffron thistle*, Carthamus lanatus. John took a specimen home to see whether the one remaining lemon yellow flower and brown seed-heads would continue to develop after being beheaded. Once walking through the forest we were surrounded by Cassinia and Bursaria in full flower. As they are all much the same height we began discussions about the hazard-reduction burns that the forest has been subjected to in recent years. Both the science of fire in Australia and the culture of fire-fighting and hazard-reduction contain innumerable complexities and contradictions. In The Pinnacle’s case it’s tragic that houses were built so close to the reserve without the prior allocation of an adequate buffer-zone from the land scheduled for development. Shrubs of native indigo [Indigofera spp.] are two other plants which have responded to fire by re-sprouting from rootstock. They flowered in spring but the subsequent rains have made them look even more healthy and we noticed that quite a few seedlings have taken-advantage of the damper soil. These young, palatable plants have also escaped the attentions of kangaroos, so far. Indigofera is a link to two tropical species bearing indigo which were used for producing dye. We found the native St John’s Wort [Hypericum gramineum] in flower amongst grasses or leaf-litter. Its orange blooms are brighter than those of Curved rice-flower Pimelea curviflora. Its name suggests the curved flowers and Pimelea refers to its seeds being fatty or oily apparently. A new book by Shepherd that’s claiming my attention lists some Pimelea species as being toxic to livestock. The delicate, ground-hugging Ivy-goodenia, Goodenia hederacea has lemon-yellow flowers. Many were in flower when John visited Black Mountain reserve. Rev. Samuel Goodenough (died 1827) is commemorated in the family name whereas hedera links the shape of this species’ leaves to the familiar but weedy ivy. Since we’re still seeing their green flowers we reckon that the good season has caused rapid growth from Onion orchids, Microtis uniflora. We could see the browning-off of some of the older flowers but the newer ones have joined the dense numbers of these green ground orchids amongst the forest’s grasses. Much more noticeable, being pink-purple, were a few remaining fringed lilies Thysonotus tuberosus. Unfortunately we found the first after Rosella had left the group. Thysonotus means fringed and tuberosus refers to the tuberous roots which, with other lilies’ and some orchids’ underground storage organs, formed part of Aboriginal diets. In two previously damp areas we found tiny rush-like plants. In the forest they released a sooty powder on being touched. Mervyn thought he had a name for these at home! Weeping grass, Microlaena stipoides and Hairy panic, Panicum effusum are two of the local grass species coming into flower as summer progresses. We think a tall-flowering grass with a dense, slightly curved flower-head may be Plume grass, a Dichelachne species rather than Brushtail speargrass, Austrostipa densiflora. It’s another species which has ‘appeared from nowhere’ as a result of the recent rain patterns. Eddy, David et.al. Grassland Flora: a Field guide for the Southern Tablelands (NSW & ACT), 1998. Fraser, Ian & McJannett, Margaret Wildflowers of the Bush Capital, 1993. Fuhrer,Bruce A Field Guide to Australian Fungi, 2005. Shepherd, R.C.H. Is that plant poisonous? An Australian Field guide for livestock, pets and people 2010.